Warm White Hostel, we are proud to share with you a lovely place full of new discoveries and friendships. We believe that a comfortable, safe and hearty home is the basis of any good discoveries in life. 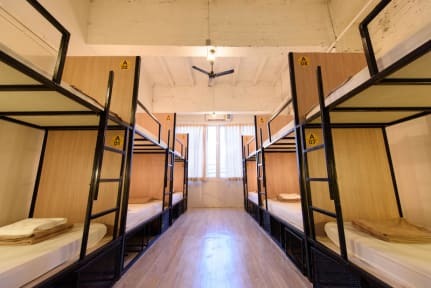 At Warm White Hostel, we have put our heart and soul into creating ourselves a perfect home away from home; a place where we will make new friends, learn new things, experience the world, slowly but surely, discover ourselves in the process. Our hostel sits in old-town Bangkok district and is a 2-3 mins walk to the buzzing Khaosan Road. The possibilities for exploration is endless here. While the grandeur of the Grand Palace, the sleeping Buddha at Wat Pho, or the Golden Mountain are a must see, we can also explore till our heart’s content in every nook and cranny of the old-town. Walk 10 mins and be at Phra Arthit peer, where we can cruise the Chao Phraya river and its canals. 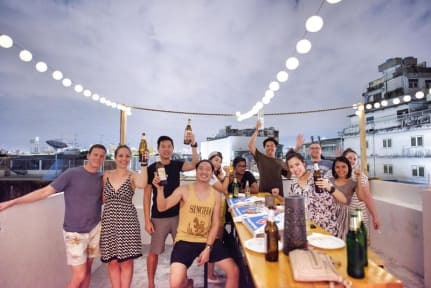 Otherwise, overcome the hangover from last night by staying in and chill with us at our communal area, or have a cold one at our rooftop to watch the sunset and get ready for another wild night in Khaosan! We wish you get more than what you are looking for in our travels. Your life’s stories are inspirational to us, and we hope you learn as much as we have from you. Hands down the best hostel I have ever been to in Bangkok. The roof top is magical. You see the madness below and your in the warm white cocoon! The staff are great, the owner is an absolute legend. Clean, social happy place to be! Nice hostel. Nice rooftop. Not a place to party, but great atmosphere to meet nice people. A special thank to Tam and Spi, you’re great! Amazing staff, only stayed one night but met loads of great chilled peeps and it right on Khaosan Road if you want to be in the thick of it. Our stay at Warm White was nice and comfortable with good air con in the room which was largely appreciated after a day in Bangkok’s heat. The location is good for someone who wants to be near a party atmosphere, Khao San Road is less than a 3 minute walk down the street. Main attractions such as the grand palace are also nearby, we found it to be a 20 min walk. WiFi is good and the rooftop bar is a nice extra for a chilled out evening. Check in was a weird experience, the lady working the desk did not know English, didn't show me to my room or tell me anything about the facilities. When I wanted to extend she made it seem like a big inconvenience. Luckily other staff members were super friendly and were actually hanging out with us. Rooftop was nice, just wish more people would have been hanging out there, it was kinda dead but I did meet a couple new friends. Found two bedbugs in my bed after noticing some small dark stains on the sheets. I understand that bedbug issues are common in SE Asia, and the receptionist was apologetic and let me move rooms quickly. However, I still feel it is important to mention this in my review. Generally I wasn’t very impressed with the hostel. The staff were friendly and the location was good, but cleanliness needs to be improved. Poor drainage means there is a weird smell through the hostel. The bedding was awful. It looked like there was mold or dirt all over the sheets and pillow cases. Location was good but overall that’s it’s. The hostel did not impress in terms of cleanliness. There were holes in my bedsheets, our bathroom flooded our bedroom and the staff did not help fix it. The bathrooms were not clean. Furthermore, the staff was unable to cancel a future reservation from their computer and their English was poor which was inconvenient. While the location was nice, I highly recommend staying st another hostel in the same area that is both cleaner and where the staff is more accommodating.